Despite my unconventional lifestyle, I tend to be very trusting of authority. In a dicey situation, I walk toward the policemen rather than away. I scoff at Mark's conspiracy theories and believe in sound science. And I lapped up the USDA food pyramid in health class, vowing to eat 6 to 11 servings of carbohydrates per day and to consume fats only in extreme moderation. At the same time, I believed in what I call the hippy food pyramid. 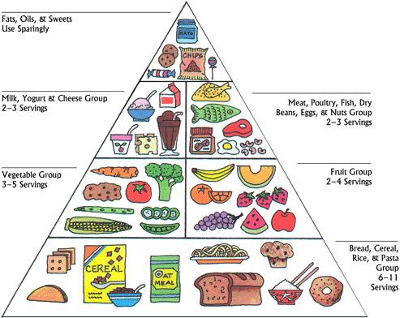 It looks a lot like the USDA food pyramid, but is a bit stricter and more specific. Whole grains make up the base of the hippy food pyramid, and soy replaces meat in many instances. The vegetable and fruit section is a little heftier and red meat is bad, bad, bad. Over the last year, though, I've been slowly learning nutritional factoids that don't seem to fit my old view of proper nutrition. As Mark and I incorporated these anti-USDA nutritional guidelines into our lives, we felt perkier, smarter, and thinner. 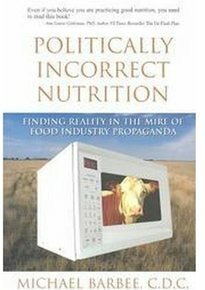 But I was concerned about making drastic shifts in our diet based on half-understood truths, so I checked out Michael Barbee's Politically Incorrect Nutrition. The book was eye-opening, full of twenty pages of small print references to back up his nutritional guidelines --- ones that my gut already told me made sense in my own life. I've excerpted the most game-changing facts in this week's lunchtime series, but this is one book I recommend checking out on your own and taking the time to slog through. Yes, it is dense, but isn't it worth putting in a bit of study time to take care of your most important possession --- your health? Our $2 ebook shows you how to break free of the rat race. I lost weight cutting carbs but did not gain any points in IQ unfortunately . I think that cutting carbs is only a small portion of good nutrition. You'll see more in later posts --- stay tuned!